This story by Marcos Lopez has appeared in numerous Spanish periodicals. We present it here with translation help from Christine Kahane. Thursday, August 14, 2008—He left one room yesterday and entered another. Without a medal on his neck. 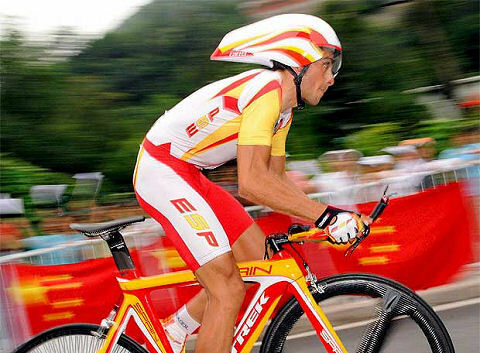 One hour after finishing the time trial, in which Fabian Cancellara of Swizterland flew towards Olympic gold, Alberto Contador was at the foot of the Great Wall of China, passing antidoping controls. First blood tests, then urine. A short distance from the Giro winner was the more youthful figure of Samu Sanchez, taking photos with his digital camera, capturing his last impressions of Beijing, the city that raised him to the top last Saturday. The race in which Contador missed a medal by a mere eight seconds was devasted first by the cyclone Cancellara–sometimes prophecies are fulfilled–then by Gustav Larsson, a Swedish rider signed last year by CSC, Carlos Sastre’s team. The little-known Swede won the silver. “I couldn’t put a face with that name,” said Samu, illustrating the stir Larsson caused among the favorites. While Contador killed time before urine analysis, he reviewed the race mentally. He started fast, was best at the first intermediate check, and became the virtual gold medalist. Later, everything that he had won in the ascent, he lost on the descent. “That’s the plain truth, but it’s not so bad,” Sanchez explained, who was only sorry that because he was the first of this select group to begin, he was never compared to the favorites in the time checks. The Asturian said it with an effusive hug for Cancellara, the model of a rider. Or the rider who didn’t want to be a model. The fastest in the world, one of the best time trial specialists that Sanchez can remember, because he has the advantage of his bulk and powerful legs in gaining seconds. While others ride like humans, Fabian rides like an extra-terrestrial, almost faster than is possible. While he was going downhill on the Great Wall, Contador was not alone. “I’m sorry to Spain, who wanted another medal. Also the people of Pinto cheered for me in the Plaza de Constitución. I felt them pushing me down the slope, only a little was missing to finish it off,” Contador lamented, still keeping sight of the big picture. He came to Beijing to add to his extraordinary palmarès (consecutive Tour and Giro, and possibly an unusual triple slam after the Vuelta in a few weeks), but hadn’t made the Olympic TT a definitive goal. It went so well that he only lacked eight seconds, the time it takes to sigh, to be in the top three and gain the honor of stepping onto the Oympic podium. Or to put it simply, the anonymous Swede surprised him. “Larsson? He did what? Silver! I don’t even know him,” Contador said, still seated on the bike on the final straight stretch of the circuit, after locking in a long and sincere hug with Sanchez, a touching moment. “I’m not going to create a stink over not getting bronze,” he said, remembering that “the best in the world were here.” For sure, no one was missing. When the road zoomed upward, Contador had the virtual medal on his chest. When the road plunged, he tried valiantly, but couldn’t hold on. Samu, too. “If the ascent had been harder, it would have gone far better,” the winner of the road race commented. “If you look at the weight and musculature of each rider, there’s the explanation,” he pointed out. Contador, who abandoned the road race, also suffered two blows to the knee. Add these factors to the different physical characteristics of the riders--the lightweight Spaniards vs. the extraordinary physique of a powerful Cancellara (1.86 meters tall, weighing 80 kilos) and the longeline of Larsson (1.95m, 77 kilos)--to explain how the medal got away. Contador was fourth, inches from the craze of an Olympic podium, even though—remember—he’s a climber. He’s not like Spartacus, as Cancellara is known to his team. The Swiss gladiator earned his country it’s first Olympic gold in Beijing. A cyclist disguised as a human locomotive, who found the necessary motivation in the sumptuous scenery along the route. “That’s how hard I had to work,” said Cancellara, who collapsed in exhaustion at the end. He crossed the goal, threw down his bike, was corralled by the media, and cried out for air. 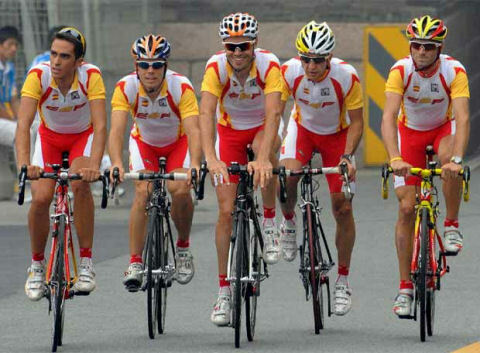 Spain’s Olympic dream team is back home from Beijing today. The squad arrived at Madrid’s Barajas airport last night after an 18-hour journey. Gold medalist Samuel Sanchez, Spanish national champion Alejandro Valverde, three-time world champion Óscar Freire, and reigning Tour de France winner Carlos Sastre had only one more night of hotels before they dispersed to their home regions. Alberto Contador, winner of the 2008 Giro d’Italia and 2007 Tour de France, alit from China just a few miles from his home in Pinto. Beijing -- Alberto Contador sprang out of the start house ready to pounce today in the men's Olympic time trial. Everything looked beautiful--the souplesse, the cadence, the grace, the concentration. He fired through the course, setting the best time at the first two check points. But things changed in the second lap. A look at his face as he passed the third check revealed that all was not well. Contador fell off the pace, losing time to Sweden's Gustav Erik Larsson at the third check, as Switzerland's Fabian Cancellara gained momentum. At the finish line, Alberto looked destroyed. He finished fourth. Disappointed, he said after the race, "It's hard not getting a medal. Everyone in Spain expected it of me." “The time trial is not my forte, but every day I work on it. I could feel Spain and the people of Pinto in front of a giant screen in the plaza. I felt their support. I hope to win a medal in the future." “Stef Clement disoriented me because first I passed him, later he came back and passed me, then I passed him again, and that breaks your rhythm. “Also Larsson surprised me, although any rider who comes here can fight for a medal. Here they’re the best time trialists in the world and give a hundred percent. Fourth place in an Olympic event is an honor--a career high point--and it was thrilling to see him race in China. For Alberto Contador, however, the day's result is no more than a tick on his palmarés, and an expensive one, at that. 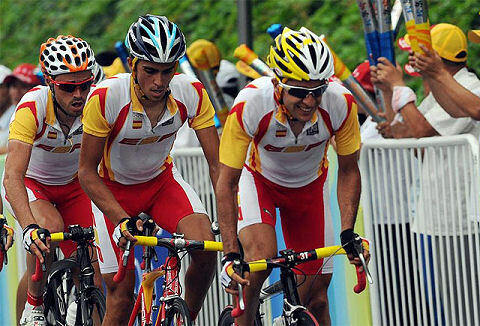 An excellent showing at the Olympic Games is history now, and thoughts turn to the rapidly approaching Vuelta a España. Hundreds of Pinteños gathered in the Plaza de la Constitución to watch a live broadcast of Alberto Contador’s participation in the men’s individual time trial, which was disputed today at the Olympic Games in Beijing. The young athlete came within only 8 seconds of a podium place. The city council of Pinto installed a giant screen for the event, and invited the neighbors to be present at 7:00 AM to support the first athlete from Pinto ever to go to the Olympics. Everyone in town could see how Contador clocked the best time in the first section of the 47.3 km race, but their collective hopes for a medal vanished in the second lap, which left only eight seconds between Contador and the bronze medal. During the race, the city of Pinto treated Contador's friends and neighbors to a breakfast of chocolate and churros, and a rock concert with accompanying slideshow of Contador’s championship rides in the 2007 Tour and the 2008 Giro. The group Mama Kids, who have dedicated a song to Contador, provided the music. How do you get from Pinto to Beijing? August 12, 2008 Mama Kids plan to rock Alberto Contador to victory and a gold medal on Wednesday, August 13. 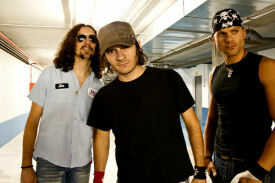 The three-man Madrileño band are giving a concert in Pinto to grind some metal vibes in Contador’s direction during his Olympic time trial bid. The performance is scheduled for 7:00 AM and will coincide with Contador’s race time at the Great Wall. When the music’s finished, Alberto will appear god-like on several big screens, addressing the crowd through a direct connection to Beijing. 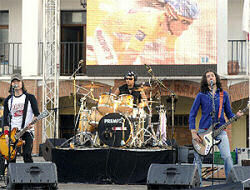 Mama Kids’ single “Quiero ser como tú” (I Want To Be Like You) is dedicated to Contador. The lyrics describe him as a pistolero ganador, or in other words, the gun-slinging winner who shoots as he salutes. They'll be singing "Quiero ser como tú" as Contador takes the start* in Beijing. So wake up, abuela. Hear their tasty stuff at YouTube when you're in the right mood. *NOTE: Alberto's official start time is 9:43:30 AM, Madrid time (US CDT 2:43:30 AM). The Olympic race of truth takes place at the Great Wall of China tomorrow, Wednesday, August 13 at 13:30, Beijing time. Alberto, No. 4, will leave the start gate at 15:43:30 PM (US CDT 2:43:30 AM). Thirty-nine riders are scheduled to compete. The field is divided into three groups of 13 men, with riders numbered in reverse departure order. Riders will leave every 1½ minutes. Group 3, the last to start, holds most of the favorites, beginning with No. 13, Samuel Sanchez, and ending with Swiss time trial specialist Fabian Cancellara at 15:48:00. The course is considered difficult. A tough rolling route with plunging descents and an uphill sprint to the finish would seem to indicate a good scenario for Sanchez—famed for his descending skills—and for the powerful Cancellara. But Sanchez and Cancellara, already medalists, might be outclassed by Alberto Contador, and face stiff competition from Levi Leipheimer, Stefan Schumacher, and others. Interestingly, Contador has trounced other TT favorites on a regular basis in 2008. Tomorrow’s test offers a golden opportunity to measure his meteoric rise against the Titans. Where there’s a will, there’s a way, especially for a wiry climber who makes up his mind and is seldom gainsaid. Vocabulary word of the day: Triskaidekaphobia. Who’s got it? Samu? Hope not. 1. Fabian Cancellara (SUI) 15:48.00. With such a team, what else can you do but win the gold medal? Enhorabueno to Sanchez, Sastre, Valverde, Freire, Contador! Alberto Contador left for Beijing at 11:30 Wednesday morning (Aug. 6), where he joined the rest of the Spanish team after an eleven-hour flight. Contador will dispute the Olympic road race on Saturday, in league with compadres Alejandro Valverde, Carlos Sastre, Samuel Sanchez, and Oscar Freire. Then he'll race the individual time trial on Wednesday, August 13, according to press manager Jacinto Vidarte. Contador returned to racing at the Clásica San Sebastián after a two-month break, and currently thinks he needs to “assimilate the work that I’ve done, which I believe has been very good. "Maybe I’m arriving at the Games slightly under-prepared, because I’m not quite back in the rhythm of competition,” he said in reference to the the weeks that have passed since he won the Giro. His first job after arriving in Beijing is “to see the parcours, because people have told me a lot about it, and I want to verify what they’ve said, as well as to see how I acclimate to the special conditions there. The race against the clock is a different matter, where everything depends on his own effort. He likes his chances. “I’ve worked a lot with the time trial bike and we’ve modified some angles, although my position was already very good. Contador will be back home in two weeks, where he’ll concentrate on getting ready for the Vuelta a España, his big goal for the end of the season.